ARDE Dicon In-Line Dispersing Grinder | ARDE Barinco Inc. Grind solid lumps into smooth slurries....disperse solid powders...emulsify oil/water. 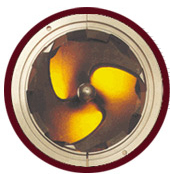 A patented impeller with three helical blades rotates at high speed inside a matching, tubular housing. The rotating impeller creates a negative pressure differential, centrifugal shoveling and positive axial thrust - drawing materials into an intensive shear zone. The centrifugal force abruptly changes the direction of the materials and drives them against the inner surface of the toothed cylindrical liner. Sharply angled teeth on the edges of the impeller blades shear the materials and force them through a tortuous path. The Dicon grinding action repeatedly accelerates and decelerates the materials, forcing them to undergo numerous changes in direction. The materials are crushed and subjected to eddy currents in a very high turbulence zone between the two sets of intermeshing teeth. The grinding action is continuously repeated as the materials move toward the discharge port. An optional discharge grid plate with a precisely positioned series of venturi-type orifices from 1/32" to 3/4" I.D., provides positive particle size control. Materials must exit through one of the small precision ports. The partially restricted discharge area provides easy-to-reproduce control of both dispersion and retention time. Whether you're working in the laboratory, prototyping a new process or looking for an in-line grinder that can swallow tank trucks full of abrasive slurry - ARDE Barinco can meet your needs. Dicon in-line grinders shred solid surfaces, grind particles, smash agglomerates, and reduce dissolving or dispersing time. The unique, high-shear design insures fast mixing and complete solid-to-liquid contact. You get faster batch turnover improved production flow. The Dicon in-line grinder's ability to grind and pump fluids with a wide range of viscosities, high-solid slurries and other hard to handle liquid may allow you to replace two pieces of equipment with one. In conjunction with metered feed streams, you may even be able to replace mixing vessels, agitators and transfer pumps. You get savings in capital equipment costs, installation charges, space requirements, maintenance and energy consumption. The precisely machined orifices of the discharge plate grid assure particle size control and prevent nozzle clogging - even in single-pass processes. Your process is protected from down-time. Easy to change impellers, liners and discharge grids allow one ARDE Dicon in-line grinder to disperse, grind, emulsify, shear, mix or blend up to 70% solids in liquids with viscosities as high as 500,000 centipoise. Designed for use in-line or recirculating to process vessels. You get a durable, versatile in-line grinder and pump with hundreds of potential applications. Aerospace-quality engineering and precision manufacturing using the finest materials assure trouble-free start and long life. The standard cantilevered impeller requires no lubrication. Loss of fluid won't damage the dependable Dicon or heavy-duty MEGAGRINDER. Specially hardened, abrasion-resistant models with heavy-duty bearings and seals are available for extra-tough applications. The simplicity of the design assures easy inspection and maintenance. You get reliability. 1. A heavy duty grinder pump. 2. An in-line high shear disperser. 3. A positive strainer that grinds up oversize lumps as they occur. 4. A high shear emulsifier of immiscible liquid mixtures eg. oil/water.